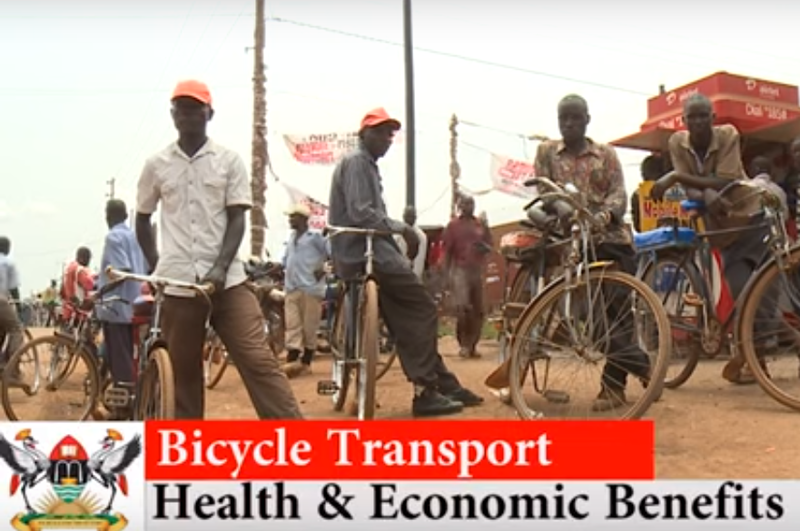 A recent news story from Kampala, Uganda shows how city officials are making the important shift from trying to ignore cyclists to recognizing that most of their citizens want to bike. This video of the story starts with the worn-out assumption that only poor people ride bicycles. But as readers of this blog know, a bicycle is often a rider’s ticket straight out of poverty. The video gets right into that with an owner of a bicycle transport business. This business man shows that not only has his bicycle business given him comfortable income and paid for his children’s education costs, he is healthy and fit because of it. We also get to meet Amanda Ngabirano, a One Street Advisor currently serving as Secretary on our board of directors. She emphasizes that people shouldn’t have to pay bus and taxi fares just to move around. She shows that by investing in bicycle infrastructure so that anyone feels comfortable riding, cities will be providing a free transportation choice for their citizens. Bicycling will also keep them healthy, lowering health costs. The story ends with an uplifting interview with a city official who is genuinely enthusiastic about their new bicycle investments, which include major bicycle provision pilot projects in downtown Kampala. I recommend taking the four minutes to watch this uplifting story of a city that will soon become a model for bicycle transportation provisions.